The Escambia County School District hosted a public meeting regarding the 2018-2019 Math Instructional Materials Adoption. At this meeting, the district and state adoption plan was reviewed. Instructions for online access to the materials being considered for adoption were also provided. The meeting was held at the Spencer Bibbs Center, 2005 N. 6th Avenue, Pensacola, FL 32503 on Monday, January 28, 2019 from 5:00 to 6:00 p.m. in room 149. The public may also visit the Instructional Materials Adoption page of the Media Services Website (http://ecsd-fl.schoolloop.com/media) for online access instructions and additional material. For more information, contact Sheila Brandt at sbrandt@escambia.k12.fl.us. The standards review will include Mathematics and English Language Arts (ELA), and will be conducted during 2019, with recommendations due to Governor DeSantis by January 1, 2020. • There will be no changes to statewide assessments or the school grades calculation in 2018-19 and 2019-20 as a result of the executive order. • Opportunities for input will be available for educators and the public before the recommendations are submitted and again through the State Board of Education rulemaking process (state law requires standards exist in section 1003.41, Florida Statutes; the State Board approves standards through Rule 6A-1.09401, Florida Administrative Code). • The instructional materials adoption timeline has been revised. • Additional details and updates will be provided throughout the review process. • A web page for the standards review is available at Standards Review. As of February 13, 2019, the State has suspended the mathematics adoption process for this year. The timeline for adoption cycle (StandardsReview 2-13-19) has been adjusted. At this time we are gathering information, as quickly as it is released, to make an informed decision about curriculum for the gap years 2019-2023. Prior to the Executive Order, new K-12 Math instructional materials were reviewed and were scheduled to be presented to the board for adoption during the 2018-2019 school year. The subject area committees K-12 Mathematics instructional materials recommendations were to be presented at the February 19, 2019 school board meeting. Due to the Executive Order, the adoption of new materials has been delayed and the committee's recommendations will be presented at the March board meeting. The public can access these materials online by visiting the Media Services website. Access instructions will be provided upon request via email or phone (textbooks@escambia.k12.fl.us / 850-595-0030, ext. 289). Public comment on these materials can be made at any time, including at the Regular School Board Workshop or the Regular School Board Meeting. Per district policy and Florida Statute, a parent of a student enrolled in an Escambia County public school or a resident of Escambia County may contest the district school board's adoption of a specific instructional material by filing a petition, using the "Motion to Contest the Adoption of an Instructional Material" form, within 30 calendar days after the adoption by the school board. The contest form can be found on the Media Services website (under Resources on this page). 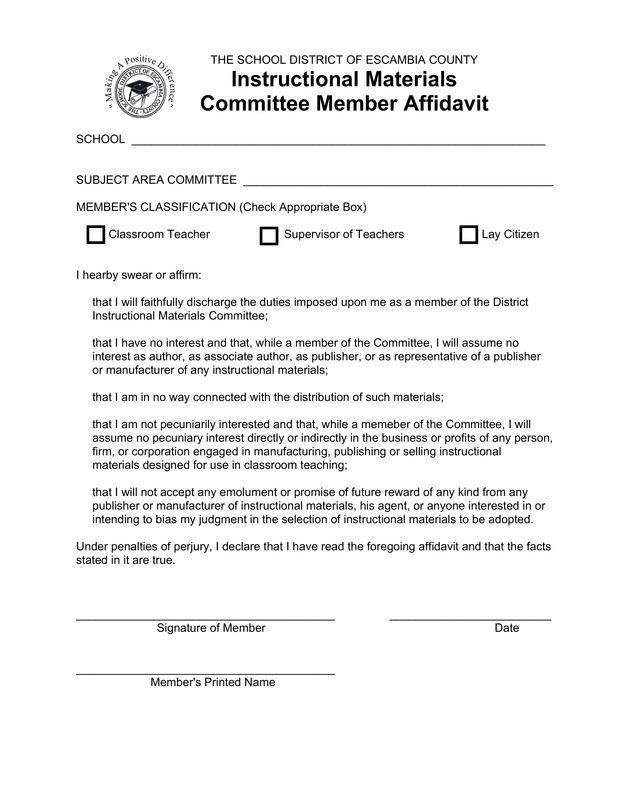 The full policy can be read in section 4.03 of the Rules and Procedures of the District School Board. Note: During the 2017-18 school year, new K-12 Science materials were adopted. These new materials are being implemented this school year (2018-19). The elementary, middle, and high school instructional materials lists have been updated to include these newly adopted Science materials.